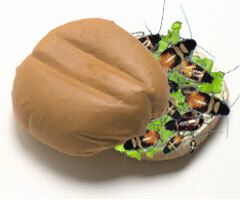 McDonald's plans to feature the McCockroach in a number of new breakfast, lunch, dinner and snack offerings, including the Bagel McCockroach, the McCockroach Big Bug Bite and Crunchy Cockroach McDippers. A Happy Meal version for children will include several live cockroaches that can be taken home and trained as pets. All versions will feature an assortment of synthetically derived flavor sauces including Mint McLiver, McLubricant, and Tall Forest McPine. "We're very excited about this new offering," said Jajajar Illyiouyr, a McDonald's spokesman. "We've been looking to expand our palate of delicious cuisine for a number of years now. With the help of Chef Rewq's genius, I think we've come up with something that will genuinely revitalize the American appetite for fast food." McDonald's has been in a bit of a pickle for several decades due to the rapid loss to disease, habitat destruction and global warming of viable, edible species that can be captured and ground up into food. Between 2050, when the last of the world's bovine population finally fell victim to mad cow disease (Bovine Spongiform Encephalopathy, or BSE) at the same time that the world's chickens, ducks and turkeys were wiped out by avian flu, and 2090, McDonald's launched a series of menu items that met with ever-dwindling consumer enthusiasm. These included the Flicker McLizard in 2057; Toad McPoppers in 2068; Slug McNuggets in 2074; the Sap McBark, a tree-derived lunch sandwich, in 2083; and Amoeba McSoup in 2088. Of these, the only to become a nationwide commercial success were Toad McPoppers, but sale of these went underground with the discovery of the succulent morsels' psychotropic side-effects in 2077. Biologists estimate that only a few dozen species fit for human consumption remain on the planet, and with most of these in tightly controlled elite feeding populations, the possibilities for mass production of populist fare have become highly limited. "Humans are immensely adaptable," said Illyiouyr, "and I think we're all pretty much amazed with how quickly we can get used to living on a diet of leeches and brackish water. But for special occasions, we still want something with a little zing, a little spice. Our line of Cockroach McMeals will satisfy that need, at the same time providing consumers a delicious, nutritious meal that even includes important fiber and roughage from the resilient little critters' exoskeletons."